The countdown on the scoreboard is in the single digits. You’ve got the ball in control as you sprint down the court. The fans are screaming at the top of their lungs and you’re zeroed in—eyes on the prize. “Five, four, three…” you go for the tie-breaking shot and watch the ball sail through the air, holding your breath as you wait for the moment of truth. Every hopeful basketball player has had the same dream. Your high school tryouts will be happening in a matter of time. 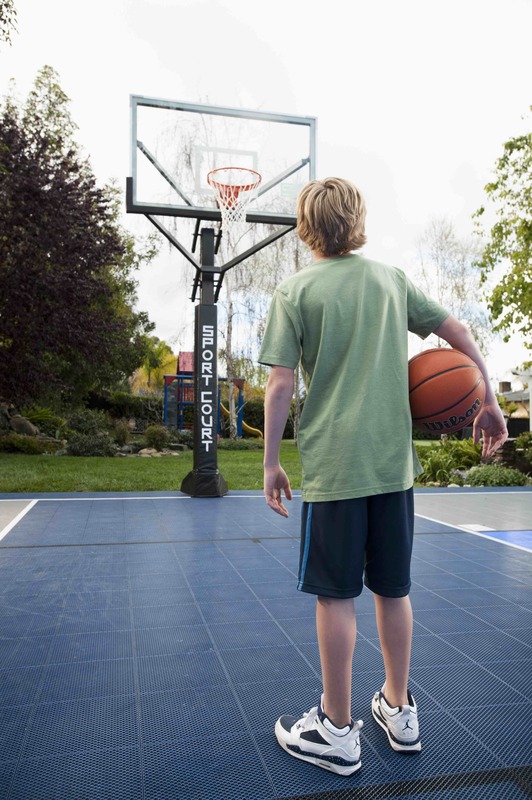 It’s the perfect time to up the amount of practice you get on your home basketball court, and work toward being the basketball star you always dreamed of. You’ve been watching the NBA preseason and are happily taking pointers from your favorite players. The star of your favorite team spends hours on end practicing on his home basketball court. Before your tryouts, you’ve got the chance to improve your own strength, making you the player you’ve hoped to be. Basketball doesn’t have to be the game of depending on your natural physical gifts. Being tall is going to help if your skill set is defending. But you shouldn’t use your height as a limitation. Quickness, lateral movement and explosiveness will boost your abilities. By improving your upper body strength, you’re preparing yourself to stand your ground, fend off defenders, make more powerful passes and all around elevate your game. When you strengthen your lower body, you’re preparing yourself to be stronger when it comes to running and jumping. Getting to the gym at all hours is nearly impossible—especially when you have homework, chores and friends to balance. But when you’ve got a home basketball court, you’re ready to train whenever you’ve got a free moment. Some of the best exercises you can use to train don’t even require extra equipment. Pushups will improve strength in your arms, shoulders core and chest. Perform a lateral lunge to improve your defensive shuffling. Stand on your home basketball court. Step your right leg out to the right, bend and hold for two seconds. Return to standing and repeat 10 times before you switch sides. Finally, performing a glute bridge will improve your explosive movements. Lie down on your basketball floor with bent knees at 90 degrees and feet flat. Bring your hips up by squeezing your glutes (be sure your shoulders and heels stay in the same place). Hold the position, lower down and repeat 10 times. Practice doesn’t make perfect, only improvement. But with enough improvement, your dreams will become a reality.